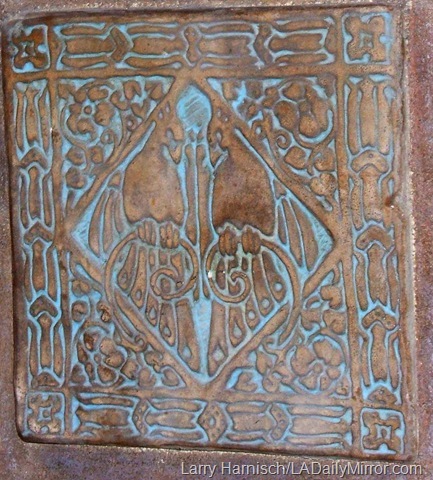 This Batchelder tile, above left, showing a pair of peacocks, has been listed on EBay. Interestingly enough, it’s the same pattern as the piece on the right, which I found in Aimee Semple McPherson’s quarters at Angelus Temple on a tour several years ago. Bidding on a pair of these peacock tiles, marked Batchelder Pasadena, starts at $137.50. This entry was posted in Architecture, Art & Artists, Batchelder Tile, Found on EBay, Interior Design, Religion and tagged #EBay, #la, Aimee Semple McPherson, Angelus Temple. Bookmark the permalink. Ernie Batchelder, an artist, lived in Pasadena, as do many creative people to this day. He was famous of course for his tiles & contribution to the Arts & Crafts period, as well as significant contributions to Pasadena. A Batchelder tile fireplace still stands in the Pasadena Playhouse.